Barbara Hoffbeck never quite felt she fit into the small farming community of Big Stone City, South Dakota—and as the youngest of seven growing up during the post-Depression era, she struggled to find her place within her large Catholic family. Barbara defied expectations at every turn, determined to prove her worth in a male-dominated time and place, whether it be by joining a "no girls allowed" hunting trip with her brothers, racing to help save her family's burning barn, or moving across the United States to New York City to pursue a career in publishing. Barbara took her experiences in stride, grounding herself in the beauty of her surroundings—an appreciation stemming from her Dakota roots. 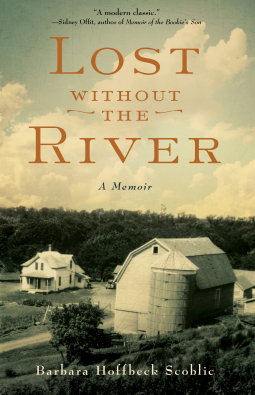 Lost Without the River is the story of a girl who grows up, leaves home, and eventually discovers an appreciation for the farm she left behind. It demonstrates the emotional power that even the smallest place can exert, and the gravitational pull that calls a person back home. I enjoyed reading this poignant memoir of a woman who grew up in northeastern South Dakota during the 1940s-50s. All her descriptions were very vivid. What is so interesting is that long after she and her siblings left the farm, they all carried vestiges of the land with them. Times were difficult for her parents, caring for a large family during the Great Depression. I empathized with her mourning as she continued to make annual trips back to her home town how time eroded people and places, left alive only in memory. I enjoyed the picture the author included and the partial family genealogy. A memorable read!